The Edgar Allan Poe Museum is a museum located in Richmond, Virginia, dedicated to American writer Edgar Allan Poe. Though Poe never lived in the building, it serves to commemorate his time living in Richmond. The museum holds one of the world's largest collections of original manuscripts, letters, first editions, memorabilia and personal belongings. The museum also provides an overview of early 19th century Richmond, where Poe lived and worked. The museum features the life and career of Edgar Allan Poe by documenting his accomplishments with pictures, relics, and verse, and focusing on his many years in Richmond. 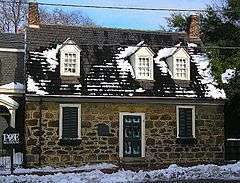 The Museum is housed in the "Old Stone House", built circa 1740 and cited as the oldest original building in Richmond. It was built by Jacob Ege, who immigrated from Germany to Philadelphia in 1738 and came to the James River Settlements and Col. Wm. Byrd's land grant (now known as Richmond) in the company of the family of his fiancée, Maria Dorothea Scheerer, whom he later married; the house was a "Home for the Bride." (One of Jacob's nephews, George Ege, was a member of the United States House of Representatives from Berks County, Pennsylvania.) Dendrochronology suggests that additional construction on the house occurred in 1754. Jacob Ege died in 1762. Samuel Ege, the son of Jacob and a Richmond flour inspector, owned the house in 1782 when it first appeared on a tax register. In 1824, when the Marquis de Lafayette revisited Richmond, a volunteer company of young Richmonders, the Junior Morgan Riflemen, rode in procession along Lafayette's carriage. One of the riflemen, the then 15-year-old Edgar Allan Poe, stood as honorguard outside the Ege house as Lafayette visited its inhabitants. The house remained in possession of the Ege family until 1911. Amidst Poe's centennial in 1909, a group of Richmond residents campaigned for the city to better recognize the writer. Citizens asked the city council to erect a statue of Poe on Monument Avenue but were turned down because he was deemed a disreputable character. The same group went on to begin the Poe Museum. The New York Times called 1909 a banner year for acknowledgement of the importance of Poe, mentioning the Richmond museum. In 1911, Preservation Virginia (formerly known as the Association for the Preservation of Virginia Antiquities) saved the house and opened it in 1922 as the Old Stone House. This day... at a first expense of about $20,000, completes the Edgar Allan Poe Shrine, and marks the seventy-second anniversary of the death of the poet. If he is aware of mundane affairs he must be pleased to find that, at length, there has been reared to his memory a lasting and appropriate memorial. Actor Vincent Price, who had played in numerous film roles based on Poe stories, was a noted fan of the author. He visited the museum in 1975 and had his photo taken with the museum's renowned stuffed raven. In 2014, his daughter Victoria Price visited the museum, saying that Poe had been such a part of her life that she thought of him as her uncle. In 2016 Victoria Price returned to Richmond as part of a film festival featuring Poe films. The festival, in addition to a Poe Goes to the Movies Unhappy Hour with Victoria Price at the Poe Museum, presented films at Richmond's historic Byrd Theatre and An Evening with Victoria Price at the Cultural Arts Center in Glen Allen, Virginia. The Poe Museum's three buildings contain exhibits focusing on different aspects of the author's life and legacy. The parlor of the Old Stone House is used for the display of furniture from the homes in which Edgar Poe and his sister Rosalie Mackenzie Poe lived. Of special interest in this room is a piano that once belonged to Poe's sister. The Model Building contains an eighteen-foot-long model of Richmond as Poe would have known it. Also displayed in this gallery are Poe's boyhood bed and furnishings from his boyhood home. The Elizabeth Arnold Poe Memorial Building includes many first and early editions of Poe's works including an 1845 publication of "The Raven" and one of only 12 known existing copies of Poe's first collection Tamerlane and Other Poems. Among the highlights of the collection displayed in this building are Poe's vest, trunk, and walking stick and a lock of his hair. Manuscripts and rare early daguerreotypes and portraits are also exhibited there. The Exhibits Building is devoted to temporary exhibits related to Poe's place in popular culture. One such exhibit was dedicated to the many theories of Poe's death and another featured illustrations of the poem by artist James William Carling. Other recent exhibits include "Poe in Comics", "Poe Face to Face: Early Portraits and Daguerreotypes of Edgar Allan Poe" and "Ratiocination: Poe the Detective". A courtyard area behind the museum includes a garden inspired by Poe's poem "To One in Paradise." This space is also available for weddings. ↑ "Virginia Landmarks Register". Virginia Department of Historic Resources. Retrieved 19 March 2013. ↑ Rothstein, Edward (30 November 2009). "For Poe, This Has Been the Year to Die For". The New York Times. Retrieved 22 September 2016. ↑ Curran, Colleen. "Poe Museum celebrates Edgar Allan Poe with the International Poe Film Festival". Richmond.com. Richmond Times-Dispatch. Retrieved 23 September 2016. ↑ Lloyd Rose: "Yo, Poe: In Richmond, a museum rises from the dead." The Washington Post, May 10, 1998. Wikimedia Commons has media related to Edgar Allan Poe Museum (Richmond, Virginia).